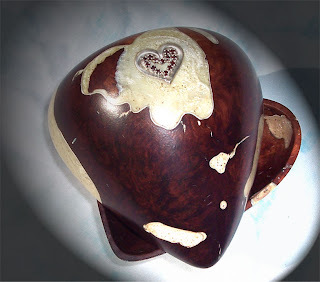 It used to be, that to become a Master woodworker, a person had to pass one last test. He had to use all of the skills he had learned from the master he studies under to craft a final piece. It would be his Master-piece. If his master approved of his work, the woodworker was now a Master himself. If he didn't approve of his work, he never would be. It's a one shot deal, there are no do-overs. Today things are done very different in most trades. But woodworking is one of the oldest professions (in here we need to interject a little story: woodworking is in fact the second oldest profession. When the first profession was offered, a branch was broken off a local tree, thus creating a club and the second profession - woodworking. The club was then used to procure the first profession, thus creating the third profession - war. And eliminating a problem that would not appear for an eon, pacifism). Back to the point: In woodworking there is still a respect for the ways of the past. Many advances have been made, but you'll find that much of that is about making things easier and faster. But those old ways still work wonderfully and still inspire the hand to touch the piece. However, most have forgotten the test of the Master Piece. Few attempt it these days. But I'm going to be among those few. I'm going to create my Master's Tool Chest as my Master's project. Because I'm a furniture builder, my Master's piece needs to contain elements of that in it's design. It will also have elements of all of the things that I can do. The biggest trick, I can't really use all of the modern electrical tools to make things easier and faster. That's right, no power tools. Am allowed to use a mill to cut, but everything beyond that, including the drying, must be done by hand. My next step is to obtain a log. That's right, not lumber, but a log. And I'll have to turn that log into lumber. Surprisingly this has been harder than expected. But I'll discuss the trouble with this later as well. Be sure to check back often as I work my way through this amazing project! This past weekend the Craft Association (CHA) held the Super Show in Anaheim. That local we had to check it out. There were hopes there would be woodworking. Unfortunately, the closest we came to seeing woodwork was the wood some of the stamps were mounted on. On the good side, the trip earned me much needed points with the scrapbooking girlfriend. 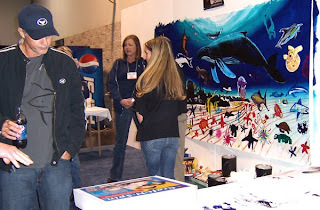 And we stumbled upon the end of a "Paint with Wyland" event. As the crowd had dissipated, and all the scrapbookers were off looking for more deals, I had an opportunity to talk with Wyland for a few moments. He was gracious and friendly. Shortly after we left the event. As we walked through the convention center, suddenly he was behind us. And we walked and talked about art and doing good with your art when you can and the like, all the way to the far parking lot. Apparently, he didn't get great parking either. Walked away knowing the whenever his name comes up in conversation, I'll always say that the colors of his paintings pale in comparison to the personality of the man. This particular one was made for a sweet sixteen and the beautiful garnet encrusted pure silver heart was contracted by Jewelry by Geffre and then inset by me. I have 6 more SLOWLY in process ranging in size from a small granny smith apple to a large red delicious. In my personal opinion - this is my best work to date. Two wooden walking canes. 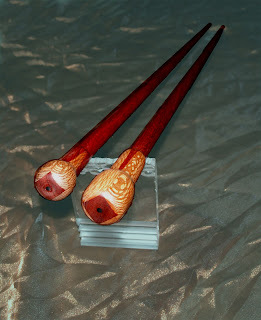 I've created these to be a very rare His and Her set of hand-turned wooden walking canes. The exotic Bloodwood, a dark red wood from South America, runs all the way through both of the walking sticks to ensure stability and strength. The Lacewood serves as a vibrant accent at the knobs of each. The black point on each knob is Solid Ebony. Not a veneer. They are finished with precatalised lacquer which is much more durable that the typical lacquer you would find on furniture...its been used to get those durable & beautiful finishes on rifle stocks for decades but has only become available to the public in the last 4 yrs & only available even to industry (other than rifle makers) for the last 6-7 yrs. The pictures just don't do these beautiful items justice. The true colors are deep and rich. I included a non-slip rubber tip installed at the ends. The female of the set stands a approximately 32 1/2" inches with a delicate knob. The male of the set is the taller at almost 34" with a larger knob. Almost 30 years of experience in custom woodworking and furniture building. I had the rare opportunity to study under a Master Artisan, who himself was trained in an apprenticeship in the Black Forest. This contact left me with a passion for the construction methods of the past. The more traditional methods of woodworking are preferred, but that doesn't mean I don't know about the modern techniques and tricks as well. 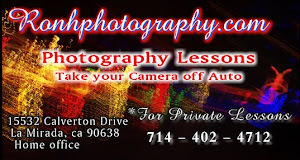 The intent of this blog will be to share a bit, teach a bit and learn a bit. Feel free to ask questions, comment on something, and give suggestions!